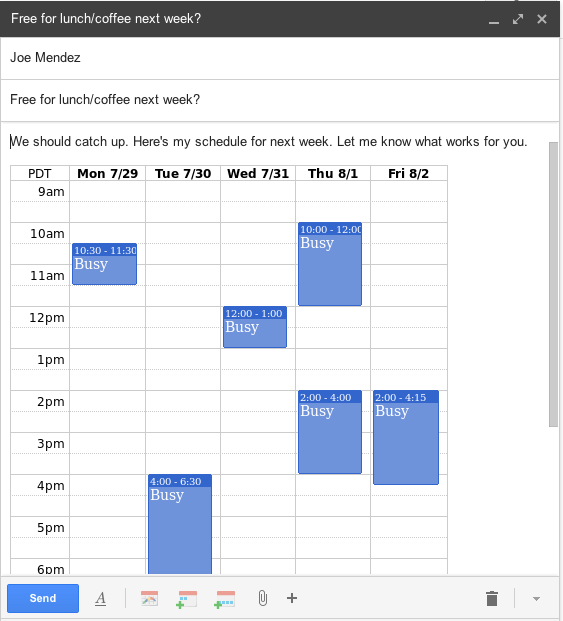 Boomerang Calendar identifies event information as you read your email. 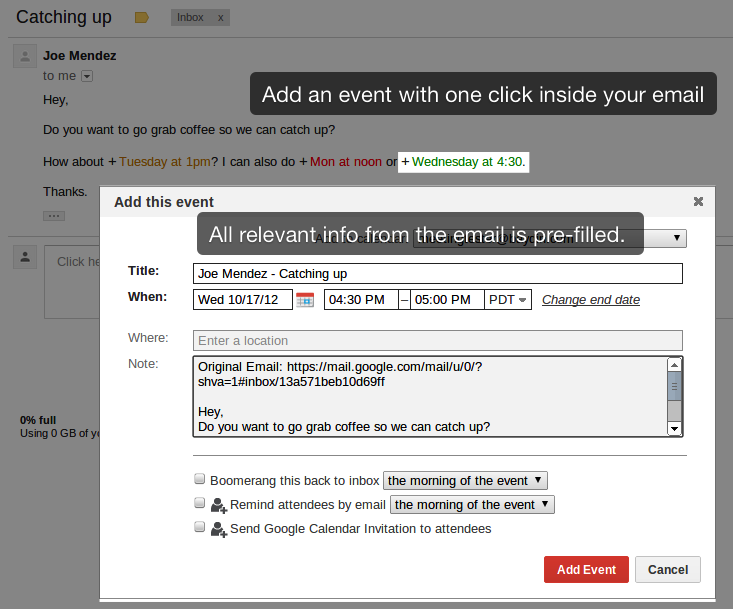 It automatically highlights dates and times in the message with information about whether or not you can attend. If the event text is green, you're all clear. Yellow, you have an adjacent event. Red means you have a conflict. No need to switch over to your calendar to check. The best part? Your friends and colleagues can write messages using whatever language they like. Boomerang Calendar understands what you mean, whether you type "Monday at 2pm" or "4/14 at noon". It even understands time zones, so if you're in Paris, "PDT" will mean the right thing. Need more details? 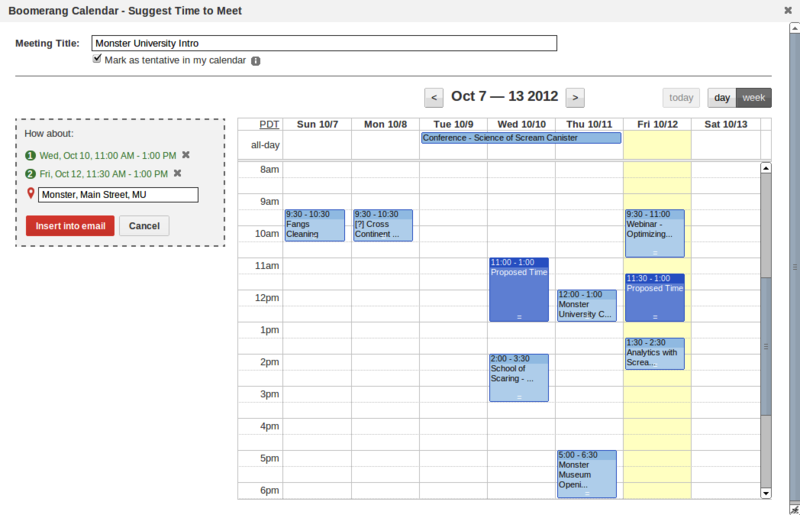 Hover over a detected time, and you'll get an at-a-glance view of the full day's schedule. Or click the time, and you can see a preview of what that event will look like in your calendar, with all the rest of your schedule prefilled. Once you start using Boomerang Calendar, you won't want to add events any other way. 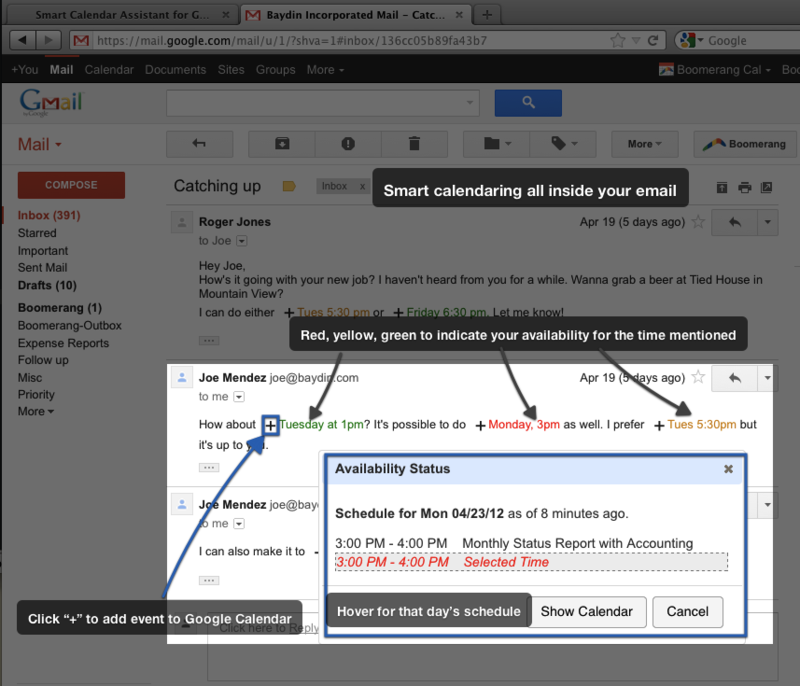 When Boomerang Calendar detects an event in an email, it provides a + icon to immediately add the event to your calendar. It will automatically fill in the start and end times, fill in the meeting's location, and populate the notes field with the body of the source email. Boomerang Calendar provides another significant enhancement over adding events the old fashioned way. If you add an event, you can check a box to automatically send reminder emails the morning of the meeting, or a couple of hours beforehand. You can also bring the original email back to the top of your Inbox when it's time to head out. You'll be more organized, and everyone will be more likely to make it to the meeting. 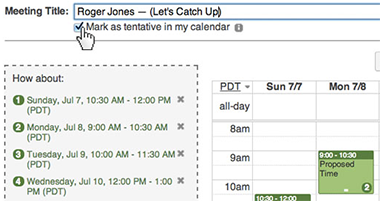 Finally, if a meeting time doesn't work for you, just click the time to open up the calendar view of the event. Just click-and-drag some times in your schedule that are available, and Boomerang Calendar will fill in a reply for you with those times filled in. You know how it goes: you try to set up a meeting, then 6 emails of scheduling back-and-forth later, someone ends up at the wrong coffee shop. Boomerang Calendar includes an interactive UI that simplifies the entire scheduling process (proposal and confirmation) to a single email. 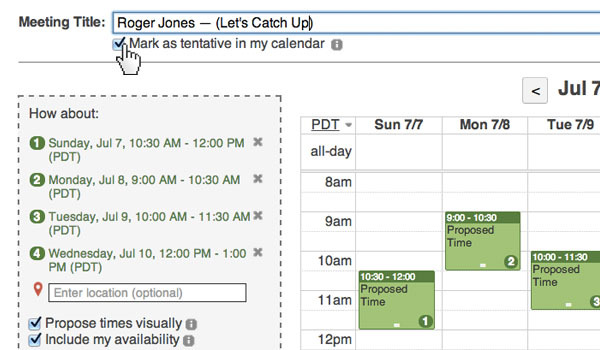 To propose a meeting, click available time slots on your calendar and Boomerang Calendar will embed the visual interface into the body of your message. To confirm the meeting, your recipient clicks one of the proposed times and the appointment is added to everyone’s calendar–no additional action by you required! 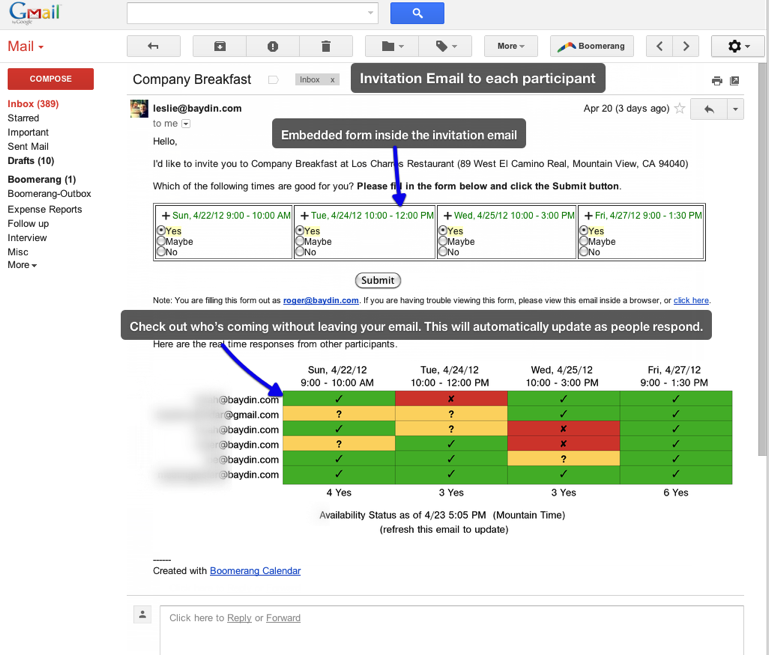 The visual availability features work regardless of whether the recipient opens your email on a phone, in Outlook, or anywhere else - they don’t need to be using Gmail or Boomerang Calendar. As your schedule fills up, the changes are automatically updated on the recipient’s visual interface, preventing you from having to send and resend your availability as your schedule changes. Now, your recipient can propose a coffee date that he or she knows will work with your schedule. When you propose a meeting and suggest multiple times, it used to be a real pain to keep track of them all so you don't double-book yourself. 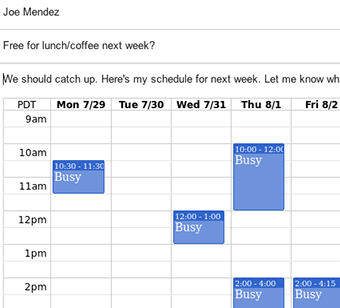 With Boomerang Calendar, sending out an email with multiple times for a meeting is as painless as proposing just one. Just check the "Mark as Tentative in my Calendar" checkbox when you're suggesting times to meet. Each one of the suggested times will be labeled with a [? ], and marked as "Maybe" in Google Calendar. When you hear back from the other party and add the event to your calendar, we'll alert you that you just confirmed a tentative meeting, so you can clear other options from your schedule with just one click. It's the first time anyone's made this process painless, and we think you're going to wonder why you ever had to live without it. What if you could boost response rates, make it easier to figure out what time to hold a group event, and handle the whole process through email, so the participants don't have to click through and register for some advertising-laden junk site to respond? Now you can. 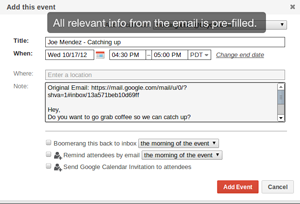 Boomerang Calendar provides a 100% email-based method for checking to see what times people can make for an event, or confirming if they will/will not attend. It uses the same intuitive calendar UI and autocomplete as in the meeting proposal features, and it generates emails that behave like magic. 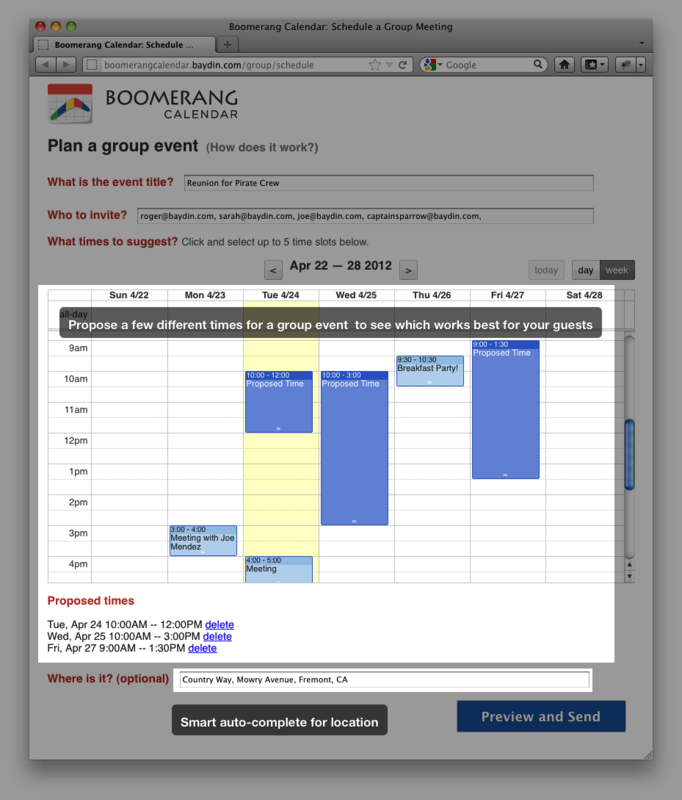 Select “Plan a Group Event” from the Boomerang Calendar Menu and click your calendar to propose meeting times. Participants can respond directly to the form inside their mail clients - they don't need to go to another site, or register, to respond to your invitation. As participants provide availability data, the email messages in everyone's Inboxes will automatically update to reflect the changes in real time. Before now, functionality like this has been impossible. Now, you'll wonder why anyone planned events any other way. Want to see more of Boomerang Calendar? Click a screenshot to expand it into full-screen glory! Now that you've been dazzled by so many wonderful features, don't you think it's time to download? Awesome! Enter it here to download Boomerang Calendar. If you want an invite code faster, click the Tweet button below, then follow @baydin. We will direct message you an invite code within 24 hours. Or, you can fill in your Email Address below, and we'll send you an invitation code as soon as we can.